REYES, Silvestre, a Representative from Texas; born in Canutillo, El Paso County, Tex., November 10, 1944; graduated from Canutillo High School, Canutillo, Tex., 1964; associate degree, El Paso Community College, El Paso, Tex., 1976; attended University of Texas, Austin, Tex., 1964-1965; attended University of Texas, El Paso, Tex., 1965-1966; United States Army, 1966-1968; Immigration and Naturalization Service, 1969-1995; member of the Canutillo, Tex., school board, 1968-1969; elected as a Democrat to the One Hundred Fifth and to the seven succeeding Congresses (January 3, 1997-January 3, 2013); chair, Permanent Select Committee on Intelligence (One Hundred Tenth and One Hundred Eleventh Congresses); unsuccessful candidate for nomination to the One Hundred Thirteenth Congress in 2012. 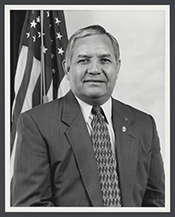 Silvestre Reyes in Hispanic Americans in Congress, 1822-2012. Prepared under the direction of the Committee on House Administration by the Office of the Historian and the Office of the Clerk, U.S. House of Representatives. Washington: Government Printing Office, 2013.